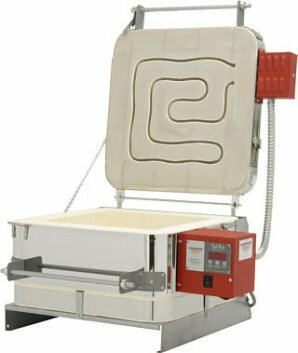 This kiln is the answer to so many requests for a kiln that runs on 120 volts but gives you the largest working area. The firing chamber is 14½ x 14½ by 6½" tall. 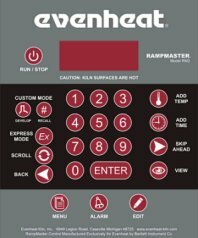 EvenHeat's dual hinge construction gives you the flexibility of using a front loading and top loading kiln all in one unit. firing chamber dimensions are: 14½" long, 14½" wide and 6½" deep. 120 volts, 15 amps, 1800 Watts, Requires 20 amp breaker and 12 gauge wiring. This kiln must be shipped via Motor Freight. We will contact you with estimated shipping costs. 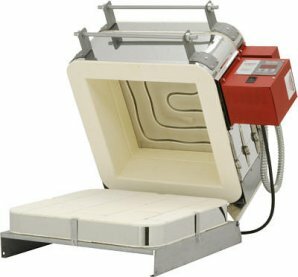 We endeavor to keep this kiln in stock in our warehouse for pick up or immediate shipment. 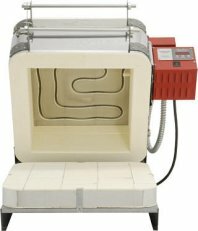 220 volt Studio 14 Kilns are a special order item. One sheet of Papyros Kiln Paper 20-1/2 x 20-1/2"